Nay Charles is an African American Vietnam veteran who no longer fits in, can’t find a job and has difficulty establishing a connection with his politically committed girlfriend. Depressed, the film’s antihero leaves his home state of Washington for a new, better life in Los Angeles where he ends up arrested by the police. Like his protagonist, director Haile Gerima is both drawn to and skeptical of the Black nationalist ideology espoused by Charles’ girlfriend and her discussion group. Charles’ alienation from both middle class African Americans who have accommodated themselves to the system and radicals willing to change society is rooted in the institutionalized racism of white society, which for the most part remains an invisible but powerful presence. Like other L.A. 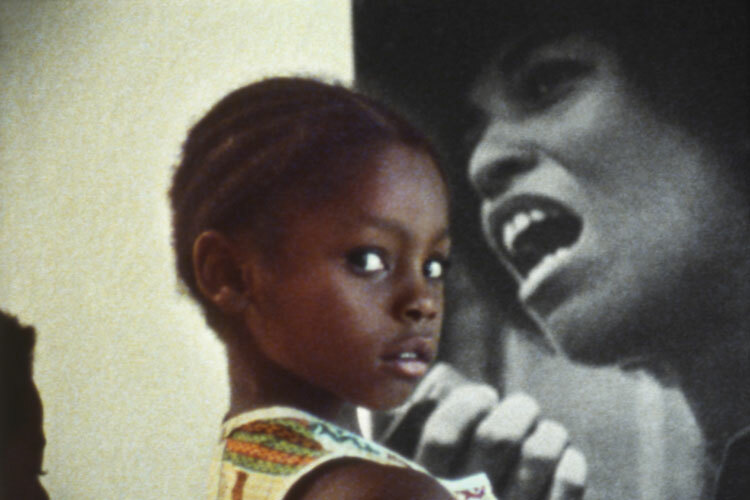 Rebellion filmmakers, Gerima illustrates that racism, as well as Third World Liberation struggles, through photo and film montages of news film material. Charles’ grandmother represents the tough fighting spirit of a generation that survived slavery and Jim Crow, her lush, green farm returning us metaphorically to the rural Ethiopia of Gerima’s youth. In the end, Gerima places his faith in African American youths, who represent a future in which they will stand tall, a final vision of utopia after the grim lessons of contemporary race relations in America. Before completing production on Ashes & Embers, Gerima founded Mypheduh Films to distribute both his own work and that of other African filmmakers being ignored by American distributors. Opening at New York’s Film Forum, Ashes and Embers has been screened widely on the festival circuit.